Try this fibre rich salad today. 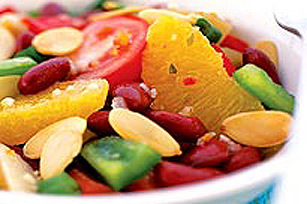 Combine beans, tomatoes, oranges, peppers and onions in large bowl. Add dressing; mix lightly. Cover. Refrigerate several hours or until chilled. Sprinkle with almonds just before serving. Substitute 1 can (284mL) drained mandarin orange segments for the orange sections. This salad provides an excellent source of vitamin C and high dietary fibre!